Being a woman in my chosen profession, that’s hasn’t posed any particular challenges. But some activities associated with just “being a woman” have sometimes proved to be a bit beyond me. Shoes you can comfortably walk a mile or two in. Articles of clothing that cover what needs to be covered even if one occasionally ends up sitting on the floor, or riding a bike, or reaching up or down for something. In principle, this should not be that hard, but in practice… Last week I was shopping at a mall for a dress for someone else (being without pockets, dresses are of limited interest to me). 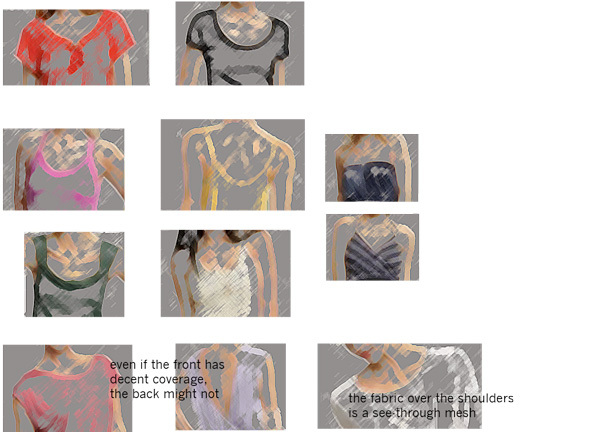 The quest was to find a lightweight, natural fabric dress, that one could wear over a regular bra (meaning one with shoulder straps, and not one of the strapless variants that can only support so much). Hours of searching turned up nothing. The salesclerks suggested wearing an extra shirt under the dresses in order to make them functional (so one stays cool in a summer dress by wearing an extra layer?). The impracticality problem isn’t limited to just dresses. Here’s an (edited) recent selection of tops from a retailer. Thankfully, my job does not require the level of sophisticated style that being a female detective on TV does. In the course of teaching SI 301 “Models of Social Information Processing” I developed a series of in-class activities and demos. The material in the most excellent textbook, “Networks, Crowds, and Markets” by David Easley and Jon Kleinberg, lent itself naturally to many such activities. Some things were interactive simulations, e.g. diffusion, cascades, and search on networks and agent based simulations of evolutionary game-theoretic models. We used a custom online information market to predict when a certain instructor would make the take-home final available. Sometimes using just cards, coins, paper and pencil, turned out to be good fun. I’d be happy if others could find ways to use and improve these demos, and am also curious about ones they have developed. Click on the image for a description of the demos.